Showing results for tags 'lovinity'. Greetings Bronies! I would like your thoughts and ideas on a new Brony show I'm planning to put together and begin airing when Season 5 of MLP begins. Here's the synopsis: *The show will air once per week, preferably one or two days after whichever day Hub releases a new episode of MLP (which is usually Saturday). It will last 1-3 hours, aiming for 2 at the moment. And it will air on an internet radio stream that I host, "The Lovinity Community Radio". *On the show, myself along with my co-host and other guests I happen to have on the show that day will discuss and critique My Little Pony (specifically the newest episodes). We will also critique and talk about the Fandom as well as fanfics and other works of the fandom. We will play some Brony music, popular new and contributed. And we hope to invite some big names on the show from time to time. *The show will be recorded and possibly available for future listening to from my website, or at least will be rebroadcast. *The show will be hosted on my website's internet radio stream, The Lovinity Community Radio. This internet platform has the capability for you to request tracks directly from my website, so I was thinking we'd load up our system with Brony music, and you all can request tracks from the site during the show. *The show will be hosted as a Skype audio call (which of course is streamed through the internet stream). That way it'll be easy for anyone to be a guest on the show if they choose to be. *There will be a phone number available for people to call in to talk live on the show. --- My website is http://lovinity.org (click "Radio" at the top to access the radio stream section, which includes a player to tune in). Official webpage for the show: http://lovinity.org/radio_wonderbronies/pg/start Thoughts are highly welcomed and encouraged. Please reply below. 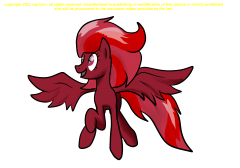 If you are interested in being a guest, whether regular or periodic, please state so in your reply and include a brief introduction of yourself and what you do in the Brony fandom. Alright exciting news every pony! Since the fall of Lovinity when it came to power (in one of the role plays and from Canterlot's residence inspection), I've thought that I'd have to terminate (kill) Lovinity off for good since she's been rejected in not just here but other places on the internet. That changed. Canterlot here offered a personal trainer for Lovinity, giving her the opportunity to lose the OP, become a realistic character, and not be rejected anymore from places. Only Canterlot offered to do such thing, and so we are grateful. Shoot the coach even gave Lovinity a last name as part of her re-birth. She is now known as "Lovinity Hearts". She is now in World of Equestria since her coaching. However she hasn't role played in there just yet. She's been busy her own, setting up a role play series in Crossovers "My OC Pony: Friendships Untold". The first episode was "attempted" in Free-for-all, but got way too out-of-hand with over-powering spells and such. So that episode fell down... and we're now trying to make a second take of the episode in Crossovers... with much more strict RP rules. In fact, the same rules of World of Equestria will now apply in this Role Play, with the exception that OCs do not need an approved application to join (but to play a cast character you do need one). That is the latest and so we must head off for now. We will talk soon again. I've seen a few people here and there on the internet do this for their OC so I thought I'd give it a go. What question(s) or other chatter do you have for Lovinity? To avoid confusion, all responses from my account on this thread are from Lovinity's character. (I thought for this it'd be appropriate) When saying something here, imagine you are talking to an actual pony from Equestria. Do not ask or say something you would not ask or say to a pony. Hearts and Hooves Day: Act of love you'll do? Hehe hello every Pony! What act of love do you plan on doing for Hearts and Hooves Day this year? <333 Me? Well I'm holding a contest on DA (sorry but it's already closing tomorrow for public voting... sorry for late notice.). And I'm going to send a very special Valentine's Day card in the mail to the winner! EDIT: Oh and I think it'd also be fun if you shared what two ponies in MLP would make the greatest couple in your opinion! What about you? 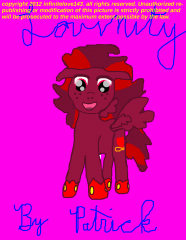 Here's a drawing of Lovinity made by nightmarefilly. Used with permission. I love the spacious depiction here, with the mirror in front of lovinity and her Cutie Mark as the sun-ish. © 2012 NightMareFilly. All Rights Reserved. 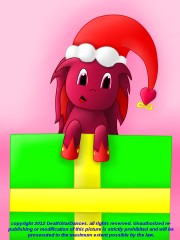 Here's a very well done drawing of Lovinity done and used with permission by SupXyro on DeviantART. I am not sure exactly what program he used, I believe it was Paint Tool Sai. © 2012 SupXyro on DeviantART. All Rights Reserved. © 2012 Patrick Schmalstig. All Rights Reserved. © 2012 DeathStarDances on DeviantART. All Rights Reserved.